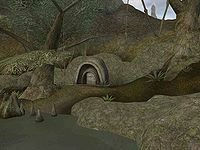 Samarys Ancestral Tomb is a medium-sized tomb on the Bitter Coast northwest of Seyda Neen. There is a shrine of St. Veloth here. 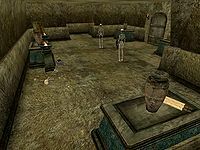 There are several leveled undead guardians in the tomb, two or five depending on your level. The loot is pretty good, consisting of a potion, a couple scrolls, and a few ingredients. There is an urn that also contains the Mentor's Ring, the key to Lord Brinne's chest and Lord Brinne's Ashes. There are no known members of the Samarys family. This page was last modified on 15 February 2014, at 13:29.